Over the past nine months over 275 of our customers and students have been participating in a Block of the Month quilt program online to learn to use their Leaves Galore and Hearts and More templates. On Friday I posted the final installment of our Block of the Month pattern on my website. I can not wait to see the progress of my students and to start posting photos of the finished quilts! The work that I have seen so far has been spectacular! The color combinations and workmanship is inspiring. But don't take my word for it, hop on over to our Magical Garden Facebook Page and join us there to see all the photos! If you are making this quilt and are in any stage of the process, please share your pictures so we can all cheer you on and see your pretty blocks. I have also been busy at work putting the final touches on the printed pattern. 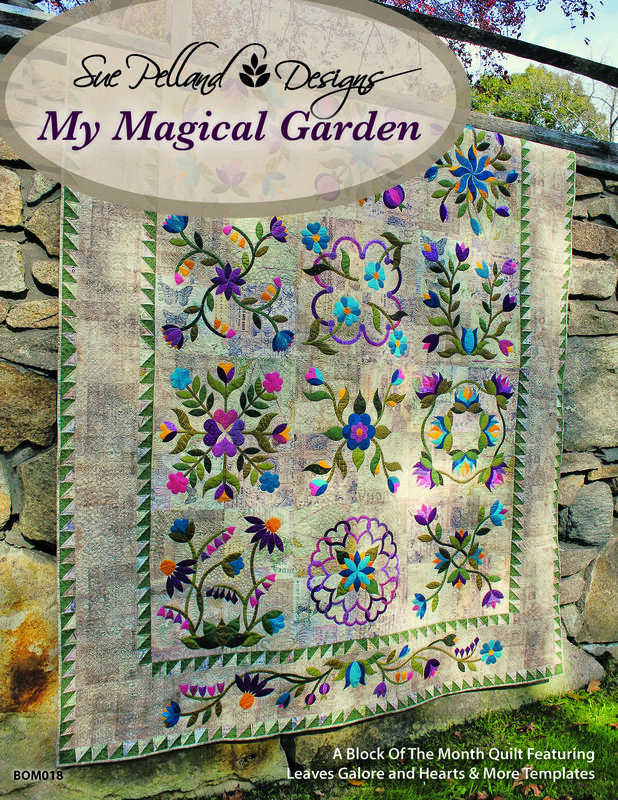 With the help of my Certified Instructors who are also making this quilt, the pattern is now perfected and ready for print! The same company that printed my two books are also printing this full color, 140 page pattern! The pattern will be printed and ready for shipping before Christmas. Now that this huge project is virtually finished, I am ready to put all my creativity into planning and making the prototype for an all new Block of the Month quilt for 2019. Won't you join us? Watch for the quilt and the BOM announcement in January. We will begin again in March with an all new Nine Month BOM program so you can learn to use SPD templates in many new ways! Meanwhile, would anyone be interested in making a quilt top in just nine days? I am cooking up a project using Sew Batik Gradations fabric that would be a block a day for nine days....making a wonderful, simple lap quilt that you can make along with me. This block will require only the Petite Leaves Galore tool and a couple yards of fabric. Sound interesting? Sign up for our newsletter, and we will be posting all the details in the next couple weeks. Until then, enjoy the hustle and bustle of the holiday season! Relax and take in all the sounds, the smells, the lights and the joy that the season will bring. I’ve enjoyed this BOM so very much. I’ve finished my Quilt top and was very pleased with Sue’s Instructions and videos that made every step easily understood. Don’t do social media so I can’t show off my accomplishment in completing the Quilt top. Thanks again Sue. I love this BOM. Don't know how I missed it!